Rachel Bess’ intentionally undersized figurative oil paintings have a seductive, time-warping character in the way that she plants modern women and men, dressed in trendy clothes, into Baroque and allegorical tableaux. The narratives are never spelled out, forcing us to press in close to study each work’s minute details for clues. 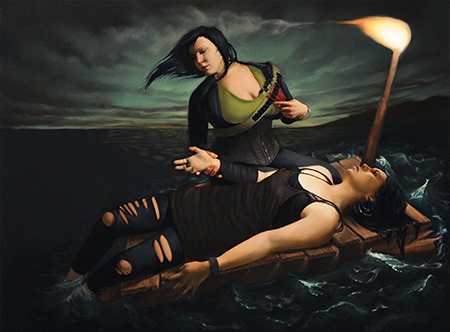 If the overarching messages resound with feminism — and they arguably do — then Bess joins a growing number of contemporary painters using pictorial tropes of lighting, costuming, posing and steady gazes to explore ideas about women’s authority and status as well as their strength and beauty. A prime example is “Prisms,” only 10-by-8-inches, in which an attractive, raven-haired woman holds what appears to be a glass shard that refracts shafts of red and gold onto her white dress and onto the black wall behind her. The title evokes a possible narrative: Is her unsmiling, insouciant expression and sidelong gaze just a prism for her underlying complexities as a woman and person? Also notable for its hints of feminism and modern/historical dichotomies is “Adventure Taking a Turn,” a 12-by-16-inch scene in which two ivory-skinned women — they could be doppelgängers — are being conveyed by a wooden raft on a green sea. One woman, kneeling, aids the other, who is prone. Details such as each woman’s index finger — the one pointing and the other crooked — further defines and differentiates their roles. Shifting focus, Bess explores death and decay in works such as “Post-Mortem Self Portrait,” in which the artist’s head rests on a velvet pillow, and “Smashed Rotting Grapefruit,” which derives its composition and lighting ideas as well as precise rendering from the still-lifes of the Dutch Masters. In addition, Bess proves her mettle as a realist painter in “Paper Snake,” in which a bare-chested African-American man proudly wears a gold paper snake like a mantle. The painting calls to mind the work of Kehinde Wiley. Other paintings have a neo-Gothic sensibility, laden with dark colors, skulls and traces of blood. Almost all of the oils on panel have ornate, somewhat overpowering, dark frames — another deliberate throwback to classical painting which she uses as a platform to pose questions about women’s empowerment, societal roles and emotional conflict.